With the support of the Eugene Berezikov team (ERIBA, Netherlands), Macrostomum cultures (NL10 strain) have been introduced in the lab in 2016. M. lignano is easily maintained in the laboratory using reconstituted seawater in a phyto-incubator at 20°C with a 14 h/10 hour day/night cycle. 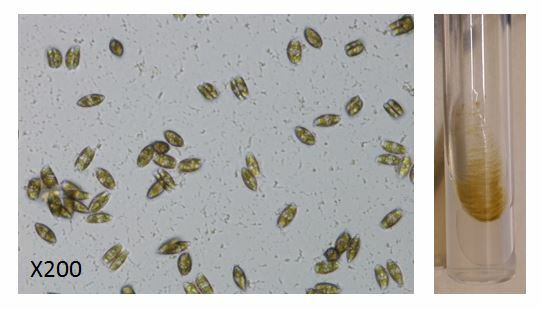 Worms exclusively feed on the diatom Nitzschia curvilineata (Fig. 1). Fig. 1. Diatoms Nitzschia curvilineata in petri dish (200x) and long term stock grown on an agarose tube. M. lignano is a hermaphrodite worm but does not carry out self-fertilization. Adults lay single cell eggs of about 100 μm in diameter that can be injected thus allowing genetic experiments. Embryonic development takes about 5 days until eggs hatch from the eggshell (Fig. 2). The generation time is about 18 days. Fig. 2. Macrostomum eggs: 1 day egg (left) 5 days egg (middle) and empty eggshell after hatching (left). All developmental stages are quite easy to observe. Macrostomum is transparent and most organs can be observed macroscopically with a simple inverted binocular microscope. Appropriate staining of entire worms allows observation of deep structures and cellular organization of organs using confocal microscopy (Fig. 3). Fig. 3. 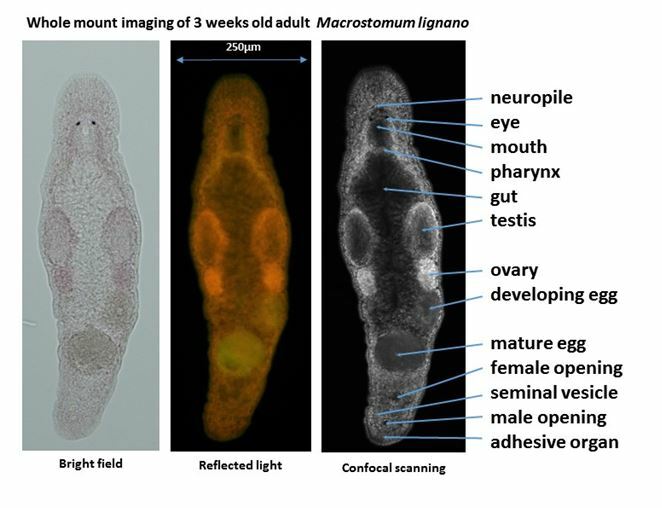 Whole mount image of 3 weeks old adult Macrostomum lignano. Ladurner P, Rieger R, Baguñà J. Spatial distribution and differentiation potential of stem cells in hatchlings and adults in the marine platyhelminth macrostomum sp. : a bromodeoxyuridine analysis. Dev Biol. 2000 Oct 15;226(2):231-41.